Lt. Colonel Kenneth E Marts was assigned to the 301st BG 301st HQ. Kenneth Elliot Marts, 79, a retired Air Force colonel who later operated a wedding photography business in Camp Springs, died of kidney failure January 19,1998 at Potomac Valley Nursing and Wellness Center in Rockville, Maryland. Colonel Marts began his military career during World War II, serving as a pilot of B-17 aircraft in the Army Air Forces. He was based in England and participated in bombing missions over Germany. Postwar assignments included command of a B-47 wing with the Strategic Air Command, chief of staff at Torrejon Air Force Base in Madrid and study at the Air Force Command and Staff School and the Air War College. He retired from the Air Force in 1965 as deputy chief of personnel of the Air Force Systems Command at Andrews Air Force Base. 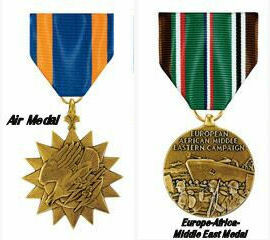 His decorations included a Legion of Merit and the Air Medal. Colonel Marts, a resident of Camp Springs for more than 30 years, was born in Wichita and graduated from the University of Wichita. His avocations included music and art, and he worked in acrylics and oils. His wife, Blanche Olive McGlade Marts, died last month. Survivors include four children, Eric Alan Marts, Kristina Lockhart, Dan Thomas Marts and Curtis Luckner Marts ; his mother, Billie Mae Marts; a sister; and four grandchildren. The following information on Kenneth Marts is gathered and extracted from military records. We have many documents and copies of documents, including military award documents. It is from these documents that we have found this information on Lt. Colonel Marts. These serviceman's records are nowhere near complete and we are always looking for more material. If you can help add to Kenneth Marts's military record please contact us. Please contact us with any biographical data, pictures or other information regarding the service and life of Kenneth Marts.